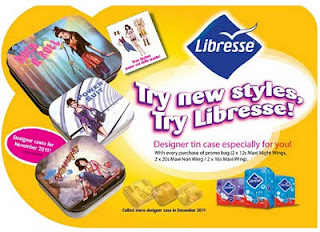 Libresse 3 new designed tin cases with FREE paper cut dolls! This December, collect all three, all new specially designed tin cases from Libresse that come with free paper cut dolls! With every purchase of a Libresse promo bag (2 x 12s Maxi Night Wings / 2 x 20s Maxi Non Wings / 2 x 16s Maxi Wings). Get yours now! 3 new designs in stores! Get all 6 tin cases now! Visit Libresse for more details.